Credit of developing Thane city in the most planned way goes to Thane Municipal Corporation popularly called TMC. It has planned many future projects for developing this city. 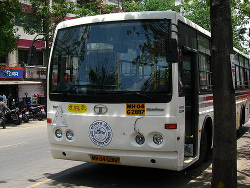 Thane Municipal Transport or TMT is the wing of TMC which is specially formed to look after public transportation needs. It operates large number of bus services to and from Thane. These TMT buses cover the entire city and ply on routes outside the city limits also. Transportation facility in Thane is a topic of great concern to the Thane Municipal Corporation. This city has developed so rapidly that barren lands are rapidly occupied by huge housing complexes. Big malls and shopping complexes have sprung up throughout the city. This has tremendously increased traffic of the city. The corporation keeping an eye on future of this city has constructed many flyovers. It has executed many projects of road widening and improving the roadways which improved transportation in Thane. TMC started its own bus service on 9th February 1989 and became the major public shuttle services in Thane. TMT buses even ply to area beyond Thane city entering neighboring cities of Mumbai, Navi Mumbai, Kalyan and Mira Bhayandar. Most of the buses ply on routes between major housing areas and Thane railway station. There was need to modify the TMT services in Thane, so that it complies with growing needs of the city. In order to achieve this corporation has scraped old buses and purchased many new buses. We at Panoramic Group’s hotel United-21 in Thane are conversant with every development and happening in the city. Since we have a firm belief that we will grow as the city in which we are established flourishes. At hotel United-21 we are always trying to cope with the growing needs of accommodation in Thane, along with the basic needs we make sincere efforts to provide most modern facilities and services to our customers.